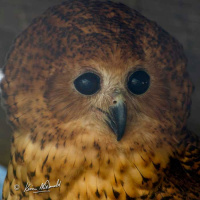 Pel's Fishing-Owl is a large ginger-brown owl without true ear-tufts. It was named after Hendrik Severinus Pel, the Dutch governor of the Gold Coast (now Ghana) between 1840 and 1850. Wail call - Salonga National Park, central DR Congo. © Bruce Marcot. Description: Upperparts are rufous-brown with fine dusky barring, dark spots and some streaks. Flight and tail feathers are barred light and dark. The throat is white, and appears inflated when the bird is singing. Underparts are pale rufous-buff with dusky shaft-streaks, these ending in a rounded spot at the tips of individual feathers. The thighs and underwing coverts are plain light rufous. The facial disk is not prominent and is rufous-brown with an indistinct rim. The head and nape have long feathers which the bird tends to carry loose, giving the head a tousled appearance. Pel's Fishing Owls have no ear tufts. Eyes are dark brown, cere is grey and the bill is black with grey at the base. Lower legs and toes are bare and pale straw coloured, with the soles having spicules instead of scales to help grip fish. Size: Length 51-61cm. Wing length 423-445mm, Wingspan 153cm average. Weight 2055-2325g. Females are larger and heavier than males. Habits: A nocturnal bird which is most active vocally on moonlit nights, especially towards dawn. Roosts during the day on large branches, often in pairs. Voice: The song of the male is a deep horn-like boom, beginning with a hoot and generally followed by a deeper and softer grunt - whoommmm-wot. This call can be heard up to 3km away! The female's call is similar but slightly higher pitched, ending in a double note. The song phrases are repeated at intervals of approximately 10 seconds. Pel's Fishing Owls sometimes feign injury, uttering penetrating trills. Females and older juveniles beg with wailing cries - wheeoouu. 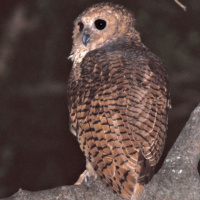 Hunting & Food: Pel's Fishing Owl can catch fish up to 2kg, but generally prey on fish from 100-200g. They will sometimes take frogs, crabs or mussels. The preferred method of hunting is from a branch overhanging water. Fish are detected by the ripples they cause on the surface; the owl then glides down to seize the fish in its talons, then swoops back up to a perch. The owl rarely immerses its body in the water and generally does not even get wet while fishing. They sometimes will forage by wading into shallow water near sandbanks. 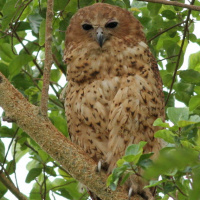 Breeding: Pel's Fishing Owl breeds mostly during the dry season, when water is shallow and clear, and fish are more easily detected. Monogamous pairs claim territories close to water by intensive hooting, especially at the beginning of the breeding season. The nest is a natural hollow or cavity in an old tree near water. Similar to most owls, they do not add any nesting material. 1 or 2 white eggs are laid averaging 62.5 x 52.1mm, and weighing around 85g. Incubation is done by the female only, while the male provides food. It lasts around 32 days and most likely starts as soon as the first egg is laid. Usually only one chick survives, and fledges at 68-70 days. Young remain in the parental territory for 6-9 months, and assume their first true feathers by 10 months. When disturbed at the nest, the female performs a distraction display by feigning injury and uttering high trills with her bill wide open. Habitat: Forest along rivers and lakes, from swamps and estuaries at sea level up to about 1700m. Riverine forest with large trees is typically preferred, as well as islands in large rivers, swamps or lakes with groups of mature trees, providing islands are not too far from the bank. Distribution: Patchy distribution from Mali and Nigeria to Senegambia, Sierra Leone, Liberia, Guinea and Ghana. 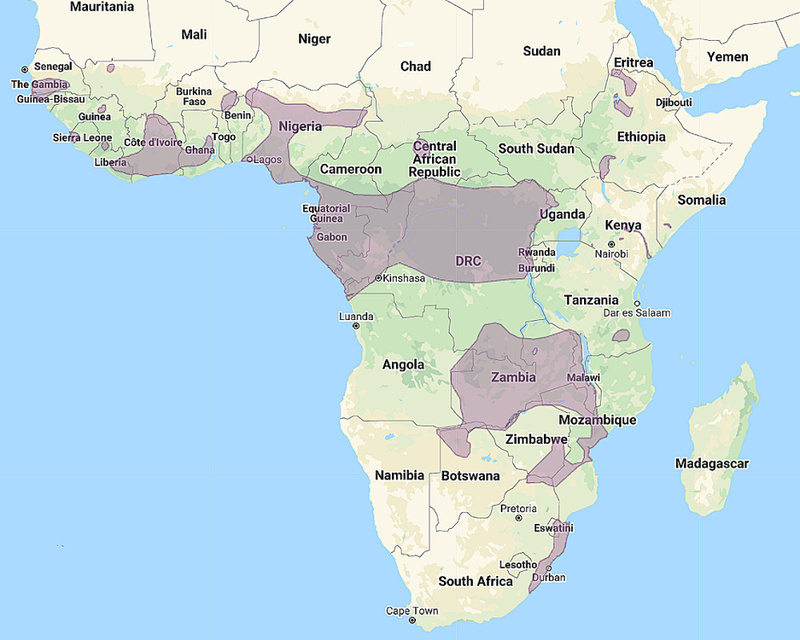 Central Africa from the coast eastwards to eastern Congo and discontinuously to Sudan, Somalia, Kenya and Tanzania, from Congo patchily southward to Zimbabwe, Botswana and eastern South Africa. Original Description: Bonaparte, Charles Lucien Jules Laurent. 1850. Conspectus generum avium, 1: p. 44. Tarboton, Warwick & Erasmus, Rudy. 1998. 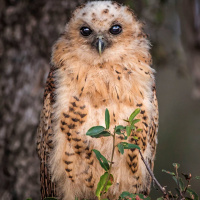 "Owls and Owling in Southern Africa". Struik Publishers. Page by Deane Lewis. Last updated 2015-10-27.